Arbor Day is a nationally-celebrated observance that encourages tree planting and care. Founded by J. Sterling Morton in 1872, it's celebrated on the last Friday in April. To learn more about Arbor Day, visit http://www.arborday.org/arborday/history.cfm. Each year the Greenscape Commission, in cooperation with the Parks Department, organizes a tree planting event in observance of Arbor Day. The Commission is pleased to have partnered with several local community organizations for the city's annual Arbor Day events including the Beech Grove Eagles, Sisters of St. Benedict, Beech Grove High School FFA, Beech Grove Promoter's Club, Blue Sky Involve, Boy Scout Pack 108 and Troop 108, South Grove Intermediate School, the Juvenile Diabetes Foundation, and Holy Name Parish. While National Arbor Day is the last Friday in April, it may be celebrated with a tree planting ceremony at any appropriate time during the year. Mayor Dennis Buckley, Matt Nelis, Brenda Wilson, Stuart Wilson, Liz Lamping and Angel McKenna. The Beech Grove Parks Department and Beech Grove Greenscape Commission hosted the 2nd Annual Going Green in the Grove Tree Giveaway and Arbor Day Celebration on April 23, 2017. A 20' Tuliptree was planted on the grounds of the Hornet Park Community Center. Five hundred native tree and shrub seedlings (Blackgum, River Birch, White Pine, Black Chokeberry and Buttonbush) were distributed at the event. This tree giveaway helps meet one of the City's Clean Community Challenge goals - to improve the environment of the community with more native flora. Going Green in the Grove participants included INPAWS (Indiana Native Plants and Wildflower Society), Beautify Beech Grove, Dammann's Lawn, Garden and Landscaping Center, Beech Grove Schools FFA students, Young Living Essential Oils, Marion County Health Department/Chartwells, Beech Grove City Schools Community Garden, Indiana Jim's Reptile Experience and Adrienne Provenzano performing as Sarah T. Bolton. Nature crafts for kids and building bird feeders were also part of the day's activities. 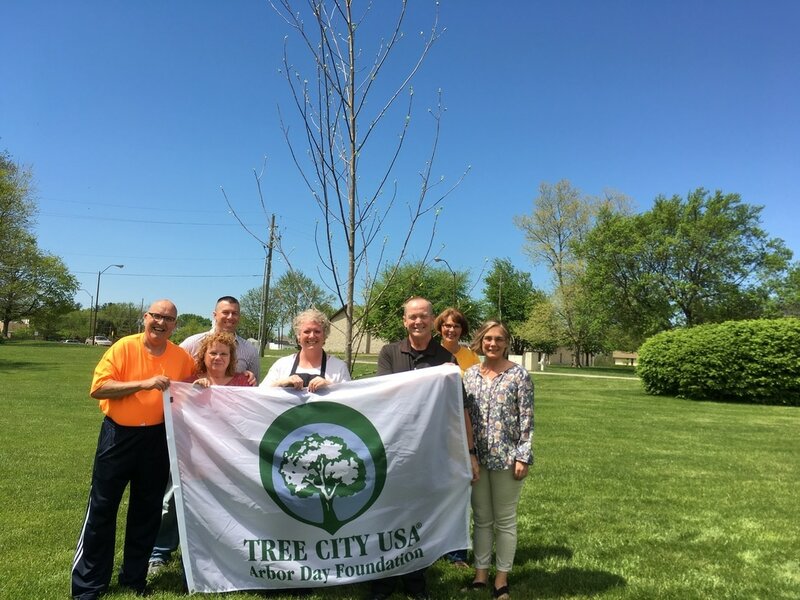 On April 30, 2016, the Beech Grove Parks Department and Beech Grove Greenscape Commission hosted the Going Green in the Grove Tree Giveaway and Arbor Day Celebration. A London Plane tree was planted at the entrance to Hornet Park Community Center. Four hundred free native tree seedlings (Sugar Maple, Sycamore, River Birch and White Pine) were available for the community. Participants in the event included INPAWS (Indiana Native Plants and Wildflower Society), Ray's Recycling, Beautify Beech Grove, Keep Indianapolis Beautiful and Beech Grove School's FFA students giving away strawberry plants. Nature crafts for kids and live animal and birds of prey shows were also part of the day's activities. 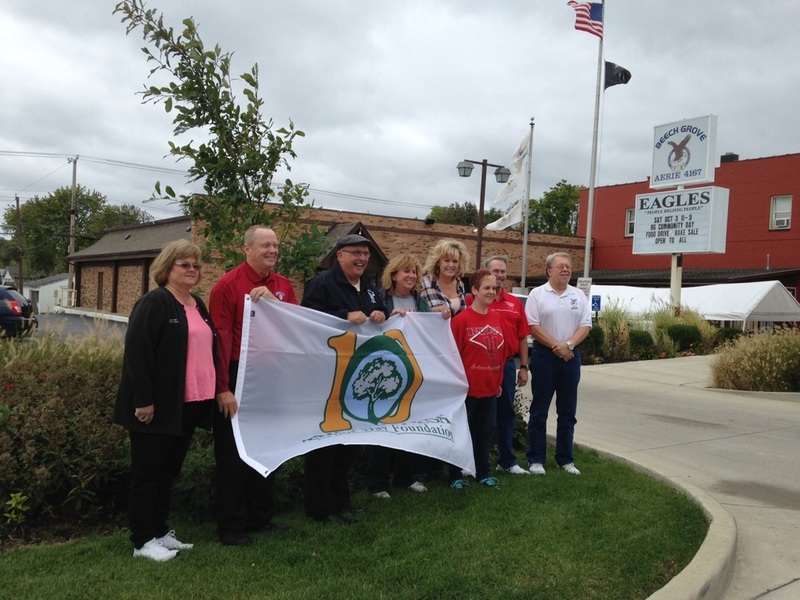 On October 3, 2015, the City of Beech Grove and Beech Grove Eagles Aerie 4167 celebrated Arbor Day with the planting of a Black Gum tree on Main Street at the entrance to the Eagles lodge. Mayor Dennis Buckley read a proclamation and the Eagles were presented with a Tree City USA flag. As part of the day's events, the Eagles collected over 500 pounds of food items for Servants Heart's Food Pantry and raised almost $1,000 for the Autism unit at Riley Hospital for Children. One hundred white pine seedlings were given away to attendees. Representatives from Keep Indianapolis Beautiful and the Beech Grove Parks Department joined the Beech Grove Greenscape Commission in providing information about their programs and services to the community. The Commissioner of the Indiana Department of Environmental Management attended to present Mayor Buckley with a plaque and two street signs recognizing and celebrating Beech Grove's designation as a CLEAN Community Challenge member. 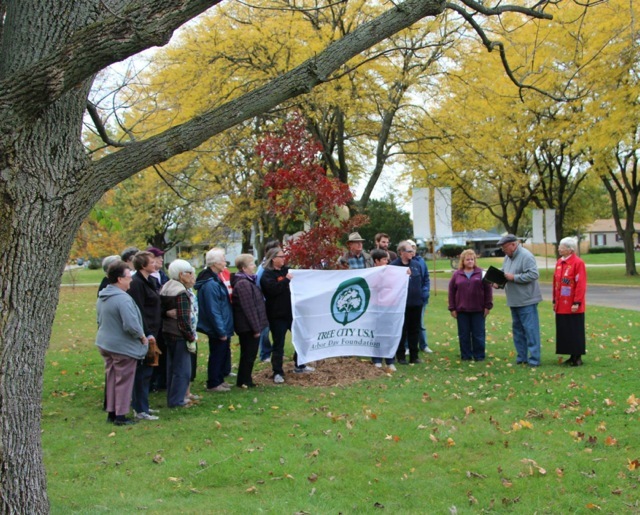 On October 18, 2014, the City of Beech Grove and the Sisters of St. Benedict celebrated Arbor Day with the planting of a Scarlet Oak tree near the circle at Our Lady of Grace Monastery. Mayor Dennis Buckley, with his wife Patty, read a proclamation and members of the Greenscape Commission presented the Sisters with a Tree City USA flag. The morning's activities included volunteers planting flowers and shrubs at the Peace and Nature Garden being constructed at the Benedict Inn Retreat & Conference Center. The project is being done with a grant and assistance from Keep Indianapolis Beautiful, Inc. The Sisters invite the community to "come by and see the beauty of our grounds whenever you get a chance." 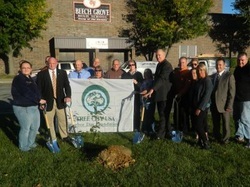 The City of Beech Grove partnered again with Beech Grove City Schools for the annual observance of Arbor Day on Tuesday, October 8 and planted two American Beech tree seedlings at the entrance to Beech Grove. High School. Mr. Chris Kaufman, BGHS Science Teacher and sponsor of the FFA Student organization provided the trees. Mr. Kaufman and his students inventoried trees on school property and noticed there were no Beech trees. Mayor Dennis Buckley read and presented a Proclamation commemorating the event. Mr. Kaufman and FFA student members. 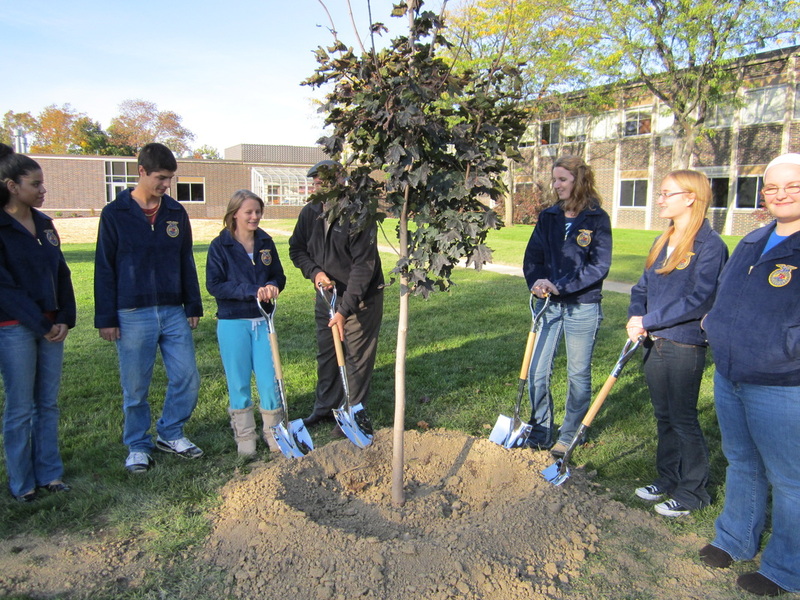 The City of Beech Grove partnered with our Beech Grove City Schools to celebrate Arbor Day on Tuesday, October 9 with a tree planting outside the new BGHS Science Academy. BGHS Science Teacher Chris Kaufman and student members of the FFA organization participated in the event. Superintendent Dr. Paul Kaiser, BGCS administrators, school principals, BGCS Board of Education members, Greenscape Commission members, Executive Director of the Beech Grove Education Foundation Melody Stevens, Mayor Dennis Buckley, and Bruce Bye, representing the National FFA Organization, were also in attendance. At the School Board meeting the same evening, Mayor Buckley presented a Proclamation from the City of Beech Grove and the Greenscape Commission presented the schools with a Tree City Flag. Our thanks to Dr. Paul Kaiser and Melody Stevens for coordinating this tree planting event. David Laker, Mayor Dilk, Kevin Cox and Bill Brown. 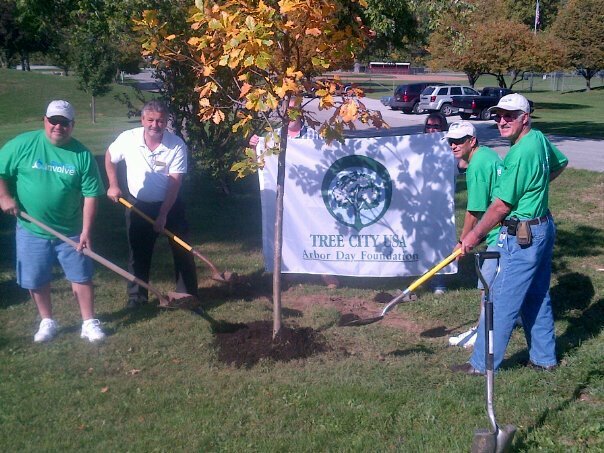 In 2011, the City of Beech Grove observed Arbor Day on Saturday, October 8 with the planting of nine trees in Sarah T. Bolton Park. Mayor Terry Dilk read the Arbor Day Proclamation and recognized local members of Blue Sky Involve, a global volunteer organization that encourages Johnson Controls, Inc. employees to work with local organizations to support environmental stewardship and projects in their community. Mayor Dilk also recognized the Beech Grove Promoter’s Club, Parks Department, Parks Board and Greenscape Commission for their efforts in making this year’s Arbor Day celebration a truly special event. A grant from Blue Sky Involve provided the funds to purchase four oak trees, four pine trees and one tulip poplar tree. Blue Sky Involve volunteers David Laker, Kevin Cox and Bill Brown assisted in planting these trees throughout the park, along with Beech Grove Promoters Tim Latimer, Ed Marks, Mike Jenne and Mike Pence, and Parks staff Tom Hannan and Randy Males. 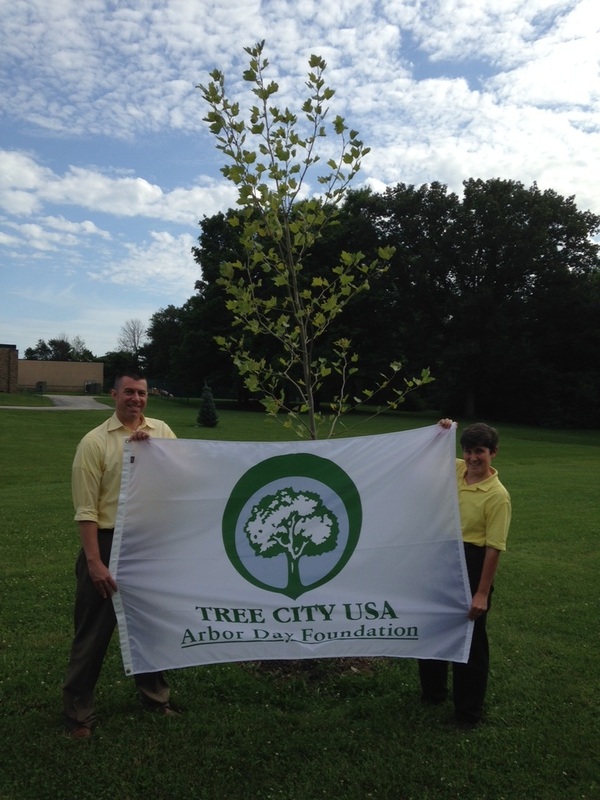 The National Arbor Day Foundation has recognized the City of Beech Grove as a Tree City USA since 2006. In support of this designation, the Beech Grove Greenscape Commission serves as a resource to educate and guide the city and its residents on selection, planting, protection and maintenance of trees and other flora.